A recent article published on MSN has dredged up the endless debate about the ethics of military reenactment that is almost as old as the events depicted, and arguably just as important. But before you berate an outsider for failing to understand the broader values of reenactment – friends and communities brought together to commemorate the past and provide an educational and enjoyable experience for modern families – Braswell does into greater detail that gives commendable value to the often criticised hobby. “There is still a lot to be said for such re-enactments, and the community involved is more diverse than you might imagine, including many groups of African-American re-enactors. But the notion that restaging battles — like Confederate memorials — is somehow needed to preserve and remember the past is one that is coming under increased scrutiny,” he said. 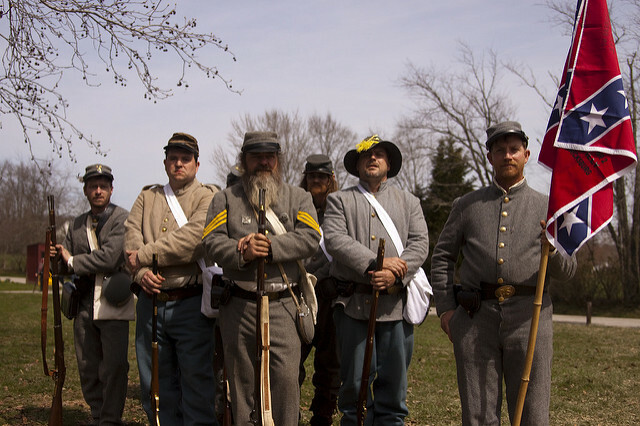 “Re-enactments are a useful tool for teaching people about history,” said Jason Phillips, a professor of Civil War studies at West Virginia University, but they “sanitize the real war by expunging its gore, squalor and hatred.” He added that playing soldier can be insensitive for another reason: the frequency and severity of PTSD among real veterans. Braswell gave the rather unsatisfactory alternative that historical reenactment should look to recreating sports events. This seems largely ludicrous given the limited costume, unpredictable nature of play and the fact that a sporting match a century ago would barely look different to today’s matches. That said, many reenactment groups do include casual sports as part of their life in camp. Phillips offers a better alternative of ‘immersive experiences’ like concerts or notable theatrical shows, the kind of living history that is already available at various holidays and costume balls – some of which even run to original agendas. What is your view on this controversial topic? Let us know in the comments below!